As expected , Grand Theft Auto V has appeared on Steam , boasting of a number of enhancements to the game as well as an all-new video editor. Grand Theft Auto V appeared on Steam today, a few days after Rockstar finally confirmed that it will in fact be released for the PC . According to the description, the game "will take full advantage of the power of PC to deliver across-the-board enhancements including increased resolution and graphical detail, denser traffic, greater draw distances, upgraded AI, new wildlife, and advanced weather and damage effects for the ultimate open world experience." It will also come with a video editor "designed for advanced movie-making," just like the PC version of its predecessor, Grand Theft Auto IV . 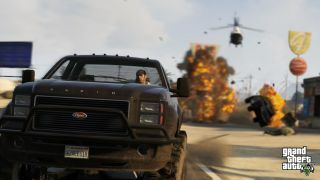 That editor allowed users to capture in-game footage, make edits in real-time, render the clips as WMV movie files and upload them to the Rockstar Social Club. There's still no hard release date, but Steam has Grand Theft Auto V pegged for the fall. In the meantime, check out this impressive (one might say obsessive) analysis of the GTAV PC announcement trailer for a look at some of the upgrades the PC release will bring to Rockstar's latest and greatest simulated playground.